I love seeing inspirational Christian quotes displayed in the home. I am always reminded of the verses in Deuteronomy where the Bible says “And thou shalt write them upon the posts of thy house, and on thy gates” (Deut 6:9). In context this verse is talking about the Scriptures and how we should teach them to our children. What better way to teach the Scriptures than to hang them in your home. Hiding God’s word in our heart helps us to remember what is pleasing to God so that we might not sin against Him (Ps 119:11). 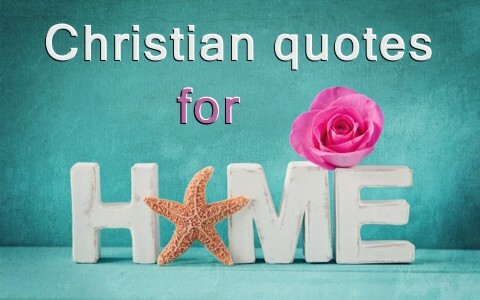 Take a look at these awe inspiring Christian quotes for the home, I have included some Scriptures and non-Scriptures. There are so many more things that you can use as great wall art ideas in your home. Consider even including them on a plaque near your outside front door, or if you have a front gate, put it there! What others are some of your favorites? Please leave them in the comments below so that we might encourage others to decorate their homes with great awe inspiring Christian quotes. Previous post: How Does The Bible Change Lives?